Spokane’s Looff Carrousel is spelled with two r’s because that’s the historic spelling. 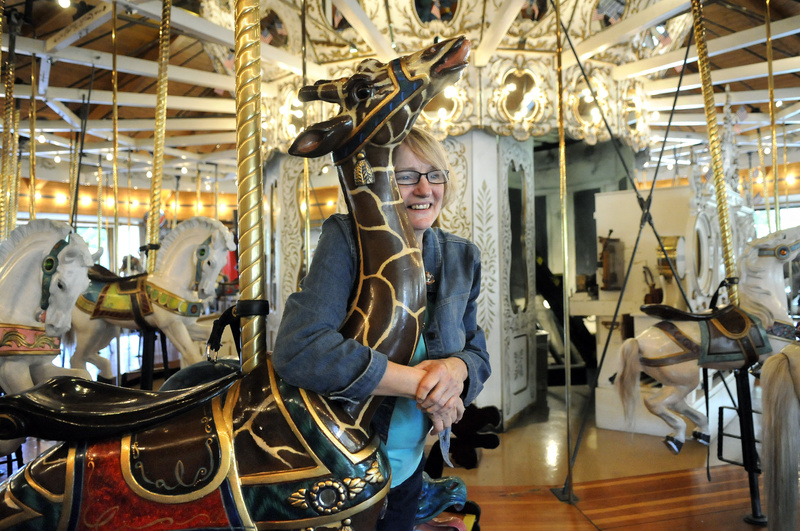 Bette Largent, who has worked on the Looff for years, has said the “carousel” spelling became widespread in the 1970s. The National Carousel Association returns this week to Spokane – home of a 101-year-old Looff Carrousel – for the group’s annual convention to promote and protect carousels around the country. Wendy Kirbey, of Albany, Ore., is attending her first convention as chairwoman of a community effort to rebuild a carousel in her hometown. Community volunteers there are building new figures for a historic carousel frame, and they hope to have the ride running in their historic downtown south of Portland four years from now. “I’ve always loved carousels,” she said on Tuesday while checking out the carousel figures in Riverfront Park. Conventiongoers will spend part of the week traveling throughout the region to see carousels and carousel projects. For example, Kennewick is planning to construct a building to house a newly restored 1910 carousel purchased from Michigan. Republic, Wash., has a 1900s vintage carousel that was obtained in the 1950s. Butte residents are carving new figures for a carousel there. Artist Bette Largent, of Spokane, has been repainting and repairing Spokane’s hand-carved wooden carousel figures since 1991. Largent is president of the carousel association. The association raises money from its members and is using the proceeds to help communities with their carousels, she said. They also provide technical workshops on carousel operation and preservation. The National Carousel Association last came to Spokane for its national convention in 1995. Among those attending is Jerry Reinhardt, director of the C.W. Parker Carousel Museum in Leavenworth, Kan., where a 1913 Parker Carry-us-all carousel was restored over a period of eight years. The museum also has a Liberty Carousel and a Primitive Carousel, circa 1850-1860. The Primitive Carousel is on permanent loan from the carousel association. The Liberty Carousel from the 1950s was built by C.W. Parker’s son, Paul Parker, and has 20 aluminum horses. “It’s our biggest tourist attraction,” Reinhardt said of the museum. The association’s archives are housed at the museum. Spokane’s carousel – with 54 horses, a giraffe, a rare “sneaky tiger” and two Chinese dragon chairs – was a wedding gift from Charles Looff to his daughter, Emma, and her husband, Louis Vogel, owners of the old Natatorium Park. In 1975, it was moved to Riverfront Park. The city estimates the Looff Carrousel has provided 21 million rides in 101 years. Largent said it has become a legacy for generations of Spokane residents.